Enables drivers to comply with factory/site health and safety requirements for maximum vehicle speeds. Increases vehicle safety in yard and/orwarehouse environment. 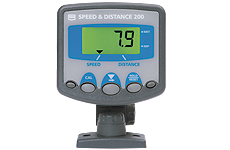 Enables accurate measurement of speed and distance. For use on any machine irrespective of wheel size. Increases vehicle efficiency and minimises machine downtime for service or repair. Identifies operators and vehicles at risk through memory feature. Internal (and optional external) alarm if pre-set speed exceeded. Alarm output can retard vehicle (e.g. operating a fuel restricting solenoid valve) depending upon installation. Overspeed and distanced travelled in excess of set speed limit. Resolution to 0.001 miles or km.